How will the rate increase work generally for fixed property transactions? 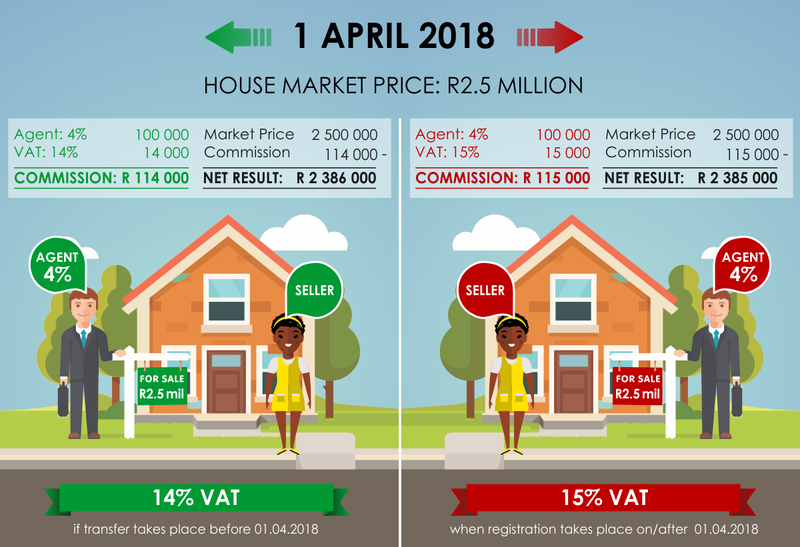 Is there a rate specific rule which is applicable to me if I signed the contract to buy residential property (for example, a dwelling) before the rate of VAT increased, but payment of the purchase price and registration will only take place on or after 1 April 2018? How will the VAT increase affect the seller of the property and estate agent commission? This entry was posted in VAT and tagged effect, increase, property transfers, registration of transfers on March 15, 2018 by Toksentjops. total amount of the invoice and VAT amount in South African currency (except for certain zero-rated supplies). declaration by the supplier stating that the supply is not a taxable supply. If a vendor fails to deduct an input tax in respect of a particular tax period, that input tax may be deducted in a later tax period, but limited to a period of five years from the date that the particular supply was made. However, when a vendor becomes aware of an output tax not declared in the relevant period, a corrected VAT return for that specific period should be submitted. It is not acceptable to declare the output tax in the next period and SARS may impose penalties and interest on the output VAT omitted. This entry was posted in VAT and tagged Tax, Tax invoices, VAT on March 31, 2017 by Toksentjops. Vir enige besigheid wat in Suid-Afrika sake doen, is dit ‘n uitdaging om op die hoogte te bly van alle vereiste registrasies en nakoming wat deur wetgewing en ander regulering voorgeskryf word. Hier volg ‘n opsomming van die mees algemene registrasies en nakoming wat op die meeste besighede van toepassing is. This entry was posted in Contract, VAT and tagged BTW, Employees tax, income tax, jaargelde, Tax, werkloosheidsversekering on September 14, 2015 by Toksentjops. A Purchaser is responsible for payment of transfer cost when acquiring an immovable property, but it should further be established if the transaction is subject to the payment of VAT or transfer duty to SARS. When an immovable property is transferred, either VAT or transfer duty is payable. To determine whether VAT or transfer duty is payable one should look at the status of the seller and the type of transaction. If the seller is registered for VAT (Vendor) and he sells the property in the cause of his business, VAT will be payable to SARS. A vendor is a person who runs a business and whose total taxable earnings per year exceed R1 000 000. He will then have to be registered for VAT. A further stipulation is that the property that is being sold must be related to his business from which he derives an income. The Offer to Purchase should stipulate whether the purchase price includes or excludes VAT. If the Offer to Purchase makes no mention of the payment of VAT and the seller is a VAT vendor, it is then deemed that VAT is included and the seller will have to pay 14% of the Purchase price to SARS. It is the seller’s responsibility to pay the VAT to SARS, except if the contract stipulates otherwise. When a seller is not registered for VAT, but the purchaser is a registered VAT vendor, the purchaser will still pay transfer duty but can claim the transfer duty back from SARS after registration of the property. The first R600 000 of the value is exempted from transfer duty. Thereafter transfer duty is levied at 3% of the value up to R1 000 000. From R1 000 001 to R1 500 000, transfer duty will be R12 000 plus 5% on the value above R1 000 000. On R1 500 001 and above transfer duty is R37 000 plus 8% of the value above R1 500 000. Transfer duty payable by an individual or a legal entity (trust, company or close corporation) is currently charged at the same rate. Transfer duty is levied on the reasonable value of the property, which will normally be the purchase price, but should the market value be higher than the purchase price, transfer duty will be payable on the highest amount. Transfer duty is payable within six months from the date that the Offer to Purchase was signed. In instances where a party obtains a property as an inheritance or as the beneficiary of a divorce settlement, the transaction will be exempted from payment of transfer duty. Where shares in a company or a member’s interest in a close corporation or rights in a trust are transferred, the transaction will be subject to payment of transfer duty if the legal entity is the owner of a residential property. This means that VAT will be payable on the transaction but at a zero rate. If both the seller and the purchaser are registered for VAT and the property is sold as a going concern, VAT will be charged at a zero rate, for instance when a farmer sells his farm as well as the cattle and the implements. Transfer duty, and not VAT, will be payable when a seller who is registered for VAT sells a property that was leased for residential purposes. 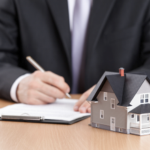 It is thus important for a purchaser to establish the status of the seller when buying a property. 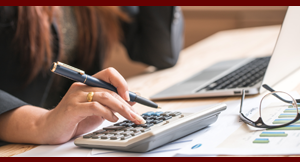 The seller who is registered for VAT should carefully peruse the purchase price clause in a contract before signing, to establish if VAT is included or excluded. This entry was posted in VAT and tagged Transfer duty; Property on September 20, 2014 by Toksentjops.